This article is about the normal showdown version. For the Xeno Clash version, see Xeno Vohu Manah Clash. Vohu Manah Showdown is one of the Normal Showdowns. It awards items to trade for the Vohu Manah summon. Vohu Manah Showdown can be farmed on Hard or Very Hard fairly easily for newer players, allowing them to easily accumulate event items. 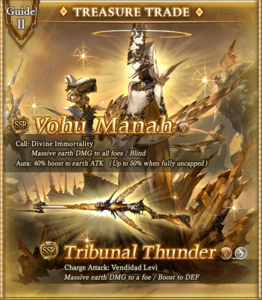 For newer Earth players, unless you happened to draw a good Earth ATK summon, getting at least 1 copy of Vohu Manah to use as your main summon will be very beneficial. The 03 Tribunal Thunder gun is the only event weapon worth mentioning; it is a decent weapon, due to the Big ATK boost and since guns have naturally high ATK, but newer players will be unable to unlock the level 120 skill as that requires a 4★ uncap, which is extremely material-intensive to perform. Keep any you find, but don't bother with any of the 02 weapons, and don't skill up the gun too much since it may not have a place in your grid later on unless you happen to draw Titan or need a Gun mainhand. As with all showdowns, you can buy 5 Half Elixirs per month, and you should be able to get enough materials to buy all 5 each month while using less than 250 AP, so it's worth spending the time to farm materials. This section is still being written, it may be wildly inaccurate or missing significant data. If you can help please feel free to edit it but please write edit summaries, preferably with sources. Found in Quests > Special, there are 4 quest difficulties. Low chance to be replaced by a Mimic. Strength: 20,000 HP / turn. 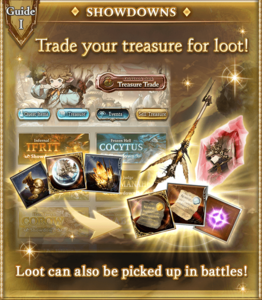 The event shop sells the Vohu Manah summon and Earth weapons. Items restock with higher costs when sold out. This page was last modified on 12 March 2019, at 04:26.